Gill Manly from South London has been a Jazz and Blues singer for thirty five years. Following an eleven year retreat from 1996 to 2007 she released a highly acclaimed jazz album in 2008 "With A Song In My Heart". Appearing regularly at The National Theatre, Barbican and Royal Festival Hall along with residences at various Chelsea clubs plus Smollenskys On The Strand she has now released her first wholly Blues album. Impressed with the sound of the acoustic blues band "Rambling Valentines" she recruited their mandola player Trevor Hyatt to collaborate with the project. The whole recording as a fine immediacy about it with patrons at The Hoodoo Lounge clearly reveling in the performance. Things get off to a flying start with Gill bringing all her Jazz sensibilities and experience to the opening cut "Lonely Avenue" from the pen of Doc Pomus, before a crowd pleasing performance on what can only be described as a Happy Blues "Lost Mind" by the legendary Percy Mayfield. The intense "You Gotta Move" leads the way into an album highlight "Grandma's Hands" with superb vocal delivery well supported by Mandola and guitar. There is an authentic down home sound to Fred MacDowell's "It's A Blessing" and great control on the Dory Previn tune "Going Home". The Sister Rosetta Tharpe anthem "Up Above My Head ", clearly a crowd pleaser follows before the only non blues offering, Lennon and McCartney's " Here There And Everywhere" is converted into a semi blues idiom and provides the closing sounds of an entirely entertaining set. 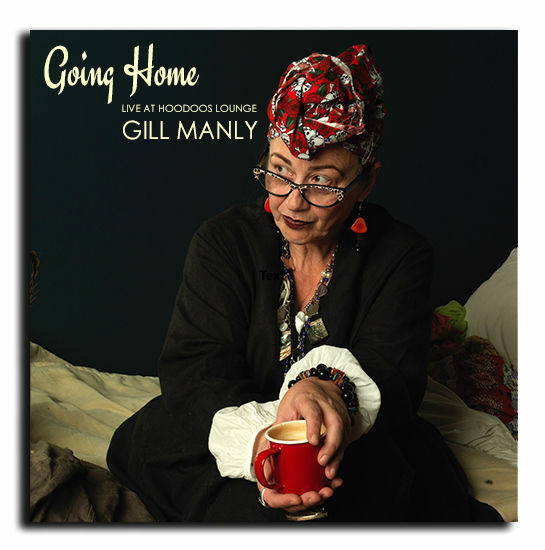 Rightfully so, Gill dedicates the release to her long time friend and mentor, the late great Mark Murphy. For followers of Jazz or Blues this album will be a valuable addition to any collection. For further information and purchase options go to www.gillmanlyjazz.co.uk.